Imagine flying from Florida to D.C. with nowhere to sit, no air conditioning, no place to store your bags — not even a bathroom. Imagine flying anywhere under those conditions. NASA has kept two 747s set up this way on purpose. The downstairs passenger area of these jetliners has been as hollow inside as possible in order to carry a very special cargo: the space shuttle. Known as the Shuttle Carrier Aircraft, or SCA, the modified Boeing 747 jetliners originally were manufactured for commercial use. The 747 four-engine intercontinental-range, swept-wing “jumbo jets” entered commercial service in 1969. 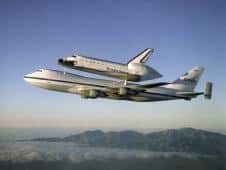 To view the interactive feature on SCA, visit www.nasa.gov/externalflash/shuttlecarrier/. During the era of the Space Shuttle Program, SCAs were used to ferry space shuttle orbiters from landing sites back to the launch complex at the Kennedy Space Center and also to and from other locations too distant for the orbiters to be delivered by ground transportation. The orbiters are placed atop the SCA by Mate-Demate Devices, large gantry-like structures that hoist the orbiters off the ground for post-flight servicing and then mate them with the SCA for ferry flights. The planes’ passenger areas were stripped of creature comforts, such as galleys, carpeting and even part of the inside temperature duct work — all for the sake of reducing weight. But the weight still is more than 250,000 pounds, and the drag created by the shape and weight of the orbiter — 176,000 pounds or more, depending on the payload — negates the small amount of lift it adds. During a normal flight, the SCA might use 20,000 pounds of fuel an hour; with an orbiter on its back, that number doubles. NASA 911 made its final flight Feb. 8, 2012. The jumbo jet’s final mission was a short flight lasting only about 20 minutes from NASA’s Dryden Flight Research Center at Edwards Air Force Base to The Dryden Aircraft Operations Facility adjacent to Air Force Plant 42 in Palmdale, Calif.
NASA 905 will ferry the shuttles to the cities of their final display venues. Those sites include the National Air and Space Museum’s Udvar-Hazy Center near Washington, D.C. (Discovery), the Intrepid Sea, Air and Space Museum in New York City (Enterprise), the California Science Center in Los Angeles (Endeavour). Shuttle Atlantis will move to the visitor center at NASA’s Kennedy Space Center in Florida and will not be ferried via the SCA. After those deliveries are completed, both shuttle carrier aircraft will support NASA’s Stratospheric Observatory for Infrared Astronomy (SOFIA) Boeing 747SP aircraft flying. –Three struts with associated interior structural strengthening protrude from the top of the fuselage (two aft, one forward) on which the orbiter is attached. –Two additional vertical stabilizers, one on each end of the standard horizontal stabilizer, to enhance directional stability. –Removal of all interior furnishings and equipment aft of the forward No. 1 doors. –Addition of instrumentation used by SCA flight crews and engineers to monitor orbiter electrical loads during the ferry flights and also during pre- and post-ferry flight operations.